European Mission: Can Life Exist on Jupiter's Moons? (Newser) – The first Europe-led mission to the outer solar system will explore the icy moons of Jupiter. 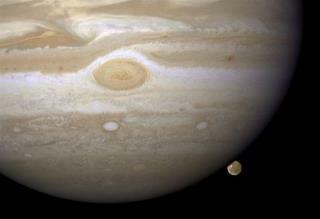 The European Space Agency approved the JUICE—JUpiter ICy moons Explorer—mission yesterday. The project's solar-powered spacecraft is scheduled to launch in 2022 and arrive in the Jovian system by 2030 to spend three years exploring the moons Ganymede, Callisto, and Europa, all of which are believed to have liquid oceans hidden below their icy surfaces, reports the Christian Science Monitor.